Biscuit Love in The Gulch. For the past several years, Nashville, Tennessee, has been a city on the rise. It’s been named the best city for millenials and one of the hottest travel destinations in the U.S. But recently it’s also become one of the most popular places in the country for bachelorette parties — and it’s easy to see why. 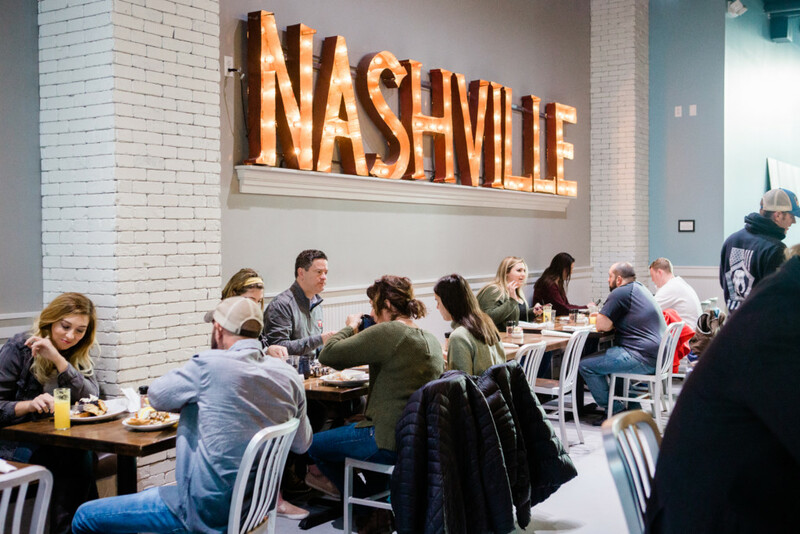 With something for every type of bride, Nashville boasts quaint neighborhoods to explore, a thriving nightlife scene, live music, some of the South’s best food, boutique hotels and more. Plus, you can easily grab a flight from Tupelo that will have you there in an hour or less. We decided to check it out for ourselves. Here’s our guide to doing your last fling before the ring in the Music City. The Art Deco inspired lobby of The Noelle Hotel in downtown Nashville. If you’re looking to experience the Broadway scene, downtown is a good place to call home base for the weekend. The Noelle Hotel was built in 1930, and through its recent reinvention has maintained that art deco style with a mid-century modern twist. The downtown hotel features beautifully styled rooms, its own Barista Parlor coffee shop, a boutique in its lobby, restaurants and a rooftop bar. Its Printers Alley location puts you right in the heart of all the city has to offer. 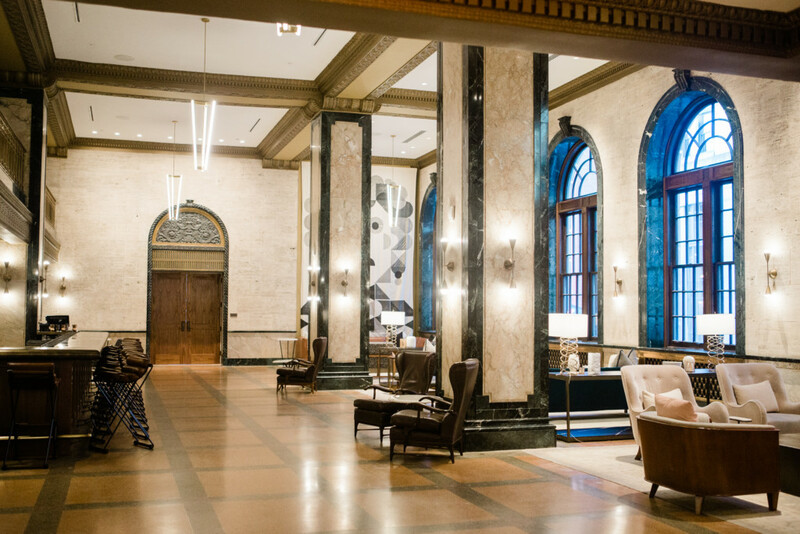 Another downtown hotel that blends modern style with Nashville history is the Union Station Hotel, which is in a 19th-century train station. Across town you’ll find another boutique option at the Germantown Inn. Opened in 2016, the Inn has that bed-and-breakfast feel while still being convenient to the city’s events and activities. The Inn features 10 rooms, each named after and inspired by a former U.S. President or prominent woman of history. Decorated in a mix of vintage and modern furniture and accessories, the Inn is a cozy place to wake up in the morning. Lunch at Cafe Roze in East Nashville. Start with pre-brunch coffee at Barista Parlor, one of Nashville’s many local coffee spots. The menu is limited but features a few select latte flavors along with all of the classic espresso drinks. Barista Parlor is all about high-quality coffee in a hip, industrial atmosphere. With five locations across the city, you should be able to find one close to where you’re staying. For a laid-back brunch option, head to Biscuit Love in The Gulch. Biscuit Love is Nashville’s hometown biscuit shop and has become wildly popular with visitors to the city. The menu features Southern favorites like a fried chicken biscuit (featuring Nashville-style hot chicken, if you can handle it) and biscuits with gravy, all starring, of course, made-from-scratch biscuits. 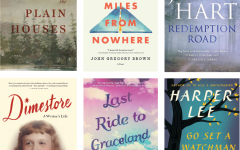 If you’re headed there on a weekend, be prepared to wait in line. Biscuit Love has another location in the Hillsboro Village neighborhood as well. Over in East Nashville is the aptly named Cafe Roze (the restaurant is full of shades of pale pink, right down to the dishes and tables). Cafe Roze serves coffee, breakfast, lunch and cocktails all day. The menu includes breakfast essentials like granola bowls, smoothies and egg sandwiches. For lunch, a variety of sandwiches topped with fresh produce are served alongside soups and sides. Don’t leave without trying the cafe’s signature drink: the Roze Latte. In Germantown, Henrietta Red serves brunch on Saturdays and Sundays. The Henrietta Red menu features a lot of seafood breakfast options along with sweet breakfast and breakfast cocktail menus. Return later in the day for the oyster bar, if that’s your thing. 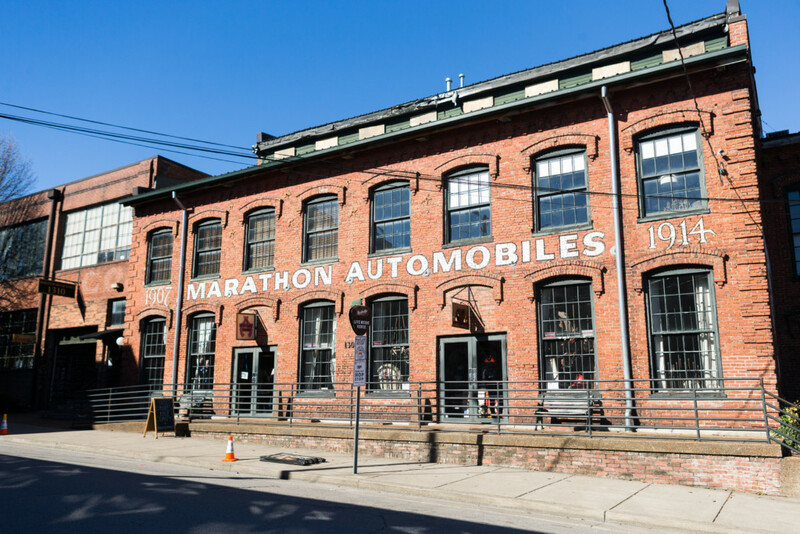 Marathon Village is a retail and dining space located inside the historic Marathon Automobiles factory. There’s no shortage of activities to do in Nashville. For shopping, check out Marathon Village, an old auto factory turned museum and retail space. As you walk through the industrial space you’ll get glimpses of the building’s past, and there are local boutiques throughout to browse. Also located in Marathon Village are a number of local distilleries. Try Corsair Distillery for artisan whiskeys and spirits, the most popular being the Triple Smoke and Corsair’s gin. Tastings and tours are available, and there’s also a bar area where you can hang out and sip on a cocktail. And if wine is more your flavor, Marathon Village is also home to Grinder’s Switch Winery. Wine tastings and wine-and-cheese pairing tastings are available by reservation on weekends. 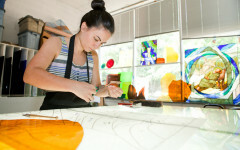 For more shopping, 12 South is a walkable neighborhood featuring local boutiques and other retailers. Two of Nashville’s well-known brands, Reese Witherspoon’s Draper James and Imogene + Willie, have flagship stores in 12 South. Once you’re done shopping, refuel at NoBaked Cookie Dough, located in Germantown and West End, because who doesn’t love eating cookie dough with a spoon? Spend the afternoon at Pinewood Social, Nashville’s restaurant/bar/bowling alley. It’s as cool as it sounds. Call ahead to reserve bowling lanes and tables in the dining room. Their in-house chef cooks up Americana fare for breakfast, lunch, dinner, and of course, brunch. For the beauty-guru bride, an appointment at Lemon Laine’s oil bar is a must. Groups learn about their skin, talk with in-store specialists and develop custom facial oil blends to meet their needs. Then, you get to take your creation home to get your skin glowing and ready for the big day. 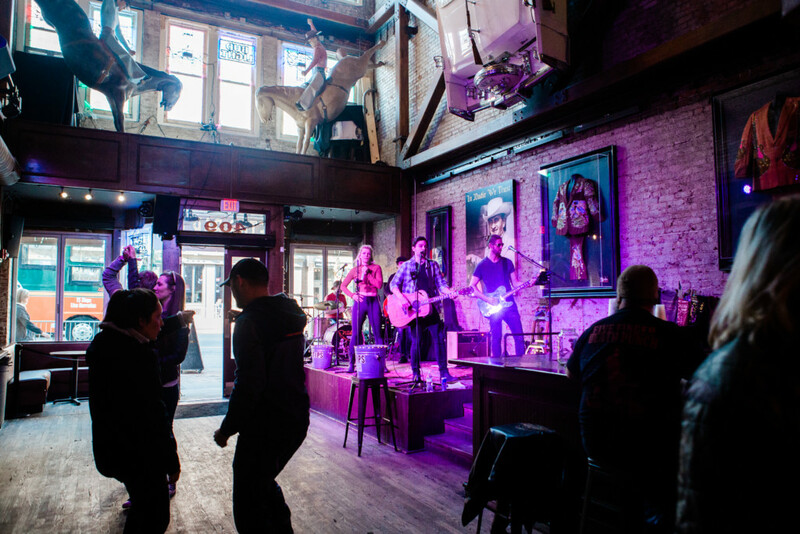 There’s always live music to be found on Broadway in the heart of downtown Nashville. The possibilities are endless, but we’ll hit some highlights. It wouldn’t be a Nashville bachelorette party if you didn’t spend some time on Broadway. Like Bourbon Street in New Orleans and Beale Street in Memphis, Nashville’s Broadway is iconic. Spanning several blocks are neon signs, colorful bars and nods to the Music City’s rich country music history. You can’t go wrong with a stop at any of these bars, all of which constantly have country music bands on stage playing classic and current hits. A relatively new destination on Broadway is The Valentine, a self-proclaimed “high-end saloon.” The four-floor bar features live entertainment, a rooftop bar, and a professional private events team to help you plan your perfect evening. 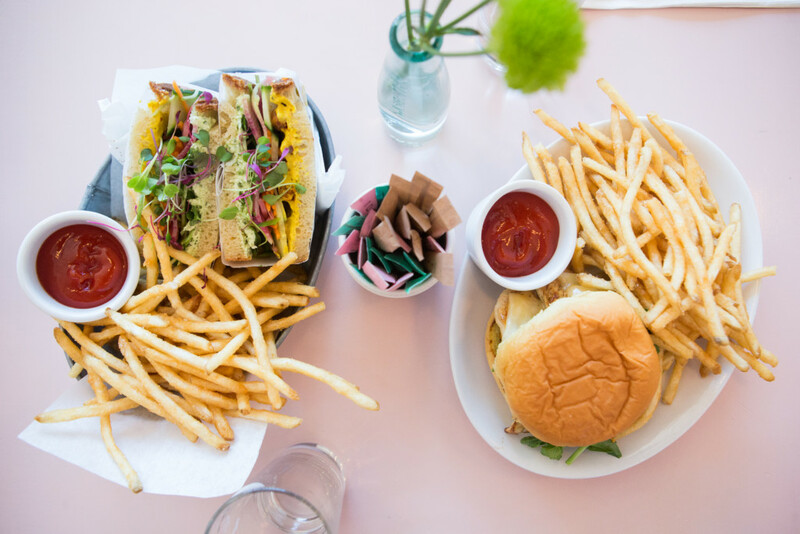 The Valentine also serves food, from small plates to burgers. For a more low-key setting, not far from downtown is The Patterson House, a speakeasy style bar serving up craft cocktails. It’s open until 3 a.m., so it also makes a nice place to wind down after a night on Broadway. There’s also Gertie’s Bar in The Gulch. Gertie’s, located inside the 404 Kitchen, has an extensive bourbon and whiskey menu as well as signature cocktails that feature them. The 404 Old Fashioned sounds like a winner: homemade brown butter, bourbon, roasted pecan syrup and bitters. Cheers! One of Nashville’s best photo spots, the “What Lifts You” mural in The Gulch. Finally, you can’t have a bachelorette trip without plenty of photo ops. Luckily, there are murals all over Nashville perfect for taking photos and boomerangs. You’ll find country music icon Dolly Parton painted on the House of Blues Studio in Berry Hill and The Kind Mural in Germantown. One of the most recognizable murals, “I Believe in Nashville,” is in 12 South. Another version has also been painted in Marathon Village. Also in 12 South, the blue-and-white striped exterior of Draper James makes a fun backdrop for group photos. 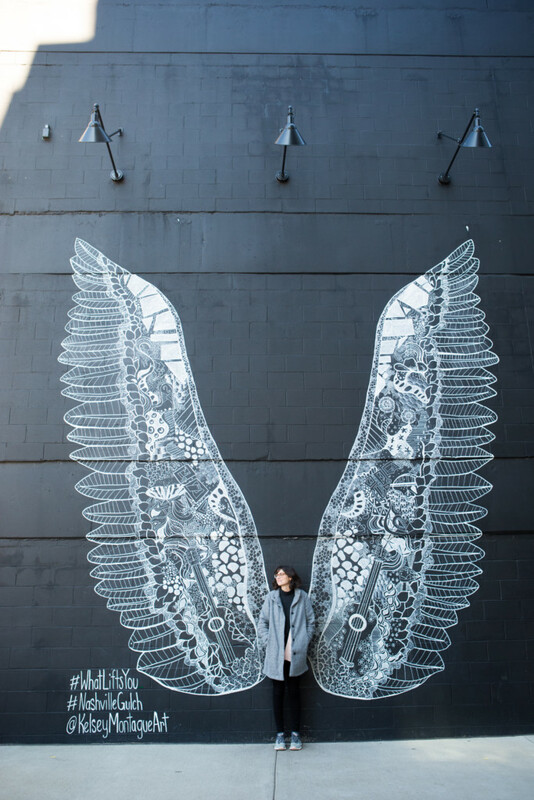 Take individual shots at the “What Lifts You” mural, which features soaring wall-sized wings, in The Gulch.